As I mentioned on Wednesday, I took inspiration from a recent gardening project to make a variety of house plant cupcakes. And it resulted in a whole bunch of cacti cupcake cuteness! Click below to check out a tutorial for these delectable edible house plants. Step #1: Bake your cupcakes. In an effort to not too realistically portray potted house plants, I decided to leave the liners on the cupcakes (instead of covering them in a clay fondant pot).These unbleached liners are great when going for a natural look. Step #2: Once your cupcakes are baked, add some icing into a bowl and add green dye – I used the Wilton “Moss Green” dye for mine. As you can see from the photo, just a little dye is needed. Step #3: Now for this step most people use graham crackers, but I love the honey flavor Teddy Grahams because they’re a bit lighter in color, which makes the dirt look more like sand (the look I was going for with these house plants). Process the teddy grahams in a food processor until semi-fine and transfer them to a bowl. Step #4: Ice your cupcake and then dip it face-down into the bowl of processed grahams, making sure to completely cover your cupcake. Now, you have your base for all of your house plants. And, make sure to save your extra icing, because you’ll need it later!! Now, once you have your cupcakes iced and covered in “sand” you’ll be able to jump around the next sections, dependent on which plants you want to make. Step #1: For both of the ribbed cactus plants, you’ll want to make the cactus base with fondant. First, add your green dye to the fondant and work it a bit to blend. 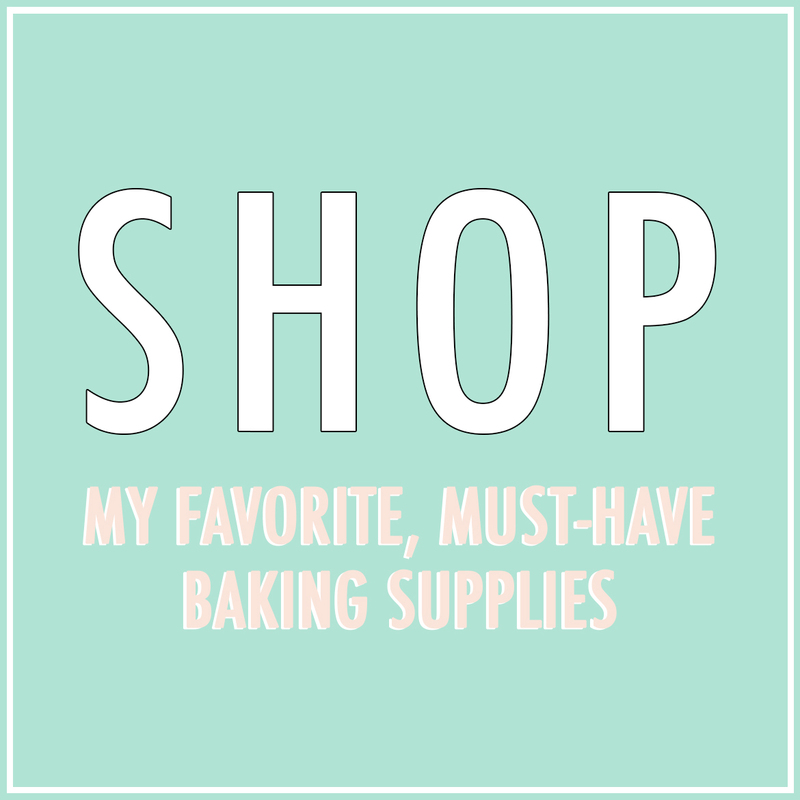 Make sure your surface (and your rolling pin!) is sprinkled with either confectioners sugar or corn starch to avoid the fondant from sticking. Note: For any unused fondant, make sure to always cover your fondant in plastic, as it will dry out very quickly. Step #2: For the taller cacti, I took one of my unfrosted cupcakes and cut out a rectangular shape of cake, which I then covered with fondant. For the smaller, round cacti, I just used a small ball of fondant for my base. 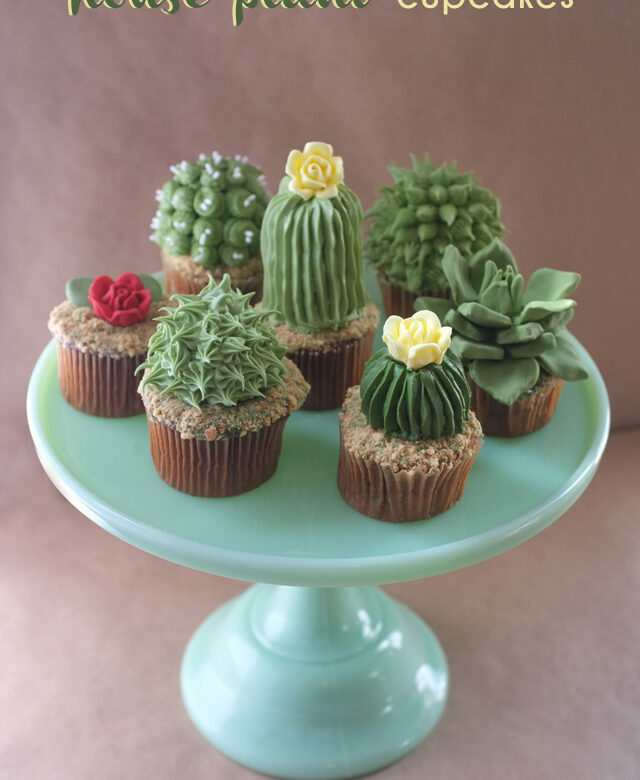 Whichever style you’re going with, make sure to apply a bit of icing under your cactus, to keep it sturdy. For the taller cactus, I used a toothpick for extra stability. Step #3: For this step, you’ll need icing tip #352 (typically for leaves). Using a pastry bag with your tip, add your leftover green icing and working with the tip parallel to the cactus, work in a linear pattern up towards the top of your cactus. Once you finish one line, you’ll want to make your next line immediately next to it, so that there aren’t any gaps in between the lines. Step #4: Once you’ve made all your lines, you’re about set, but since you worked toward the top-center of your cactus, you’ll want to add a flower here. For this step, I don’t have photos because I had previously made a bunch of these roses for another cake I was working on, but there are amazing YouTube tutorials HERE and HERE that will show you exactly what to do. Once you have your flower, add it to the top of your cactus plant. You’ll need a piped pastry bag with either yellow or red buttercream icing to make them. And for the cupcake with the leaves and the rose, I just molded those leaves out of the fondant. Genius name, right?! I am no botanist, so apologies for the lack of proper verbiage here, but I thought leafy plants did it some justice. Step #1: You may need to make some more icing if you’ve already used your leftovers. If so, do it up! Step #2: Add your green icing to the pastry bag, using icing tip #21. Add a base of icing in a circular pattern – going up about 1.5 – 2″ from the center of your cupcake, dependent on your desired plant height. Once you’ve added your base icing, test out the tip a bit on a plate so you can see the pattern that comes out. You’ll notice that if your icing isn’t chill enough, it’ll be a bit runny. Step #3: I made the other leafy cupcake (pictured in the photos at the beginning of the post) with less chilly icing, but for the plant pictured right above, you’ll want your icing to be very chill, so it’s a bit harder of a consistency. Remove the tip and refrigerate the bag of icing for 20-30 minutes to get this desired consistency. Step your cupcake with the icing base on it in the fridge as well, to allow it to harden. Step #4: Pull your icing bag out of the fridge and working outwards, add your spiky leaves. There’s no great way to show this, you’ll just have to play around and become comfortable with how the icing tip and the icing work together. It may not be super easy, but don’t worry, you’ll be able to figure it out with a bit of practice! Just remember, if you want longer leaves, you’ll need the icing to be fresh out of the fridge and chill. For the succulent plant, I followed THIS awesome tutorial from Pixel Whisk. Basic steps are below. Step #1: Just as directed with the ribbed cacti cupcakes, you’ll want to add green dye to fondant and work it to blend. Again, make sure your surface (and your rolling pin!) is sprinkled with either confectioners sugar or corn starch to avoid the fondant from sticking. Step #2: Roll out your fondant so it’s about 1/8″ thick. Using these 3 various-sized flower cookie cutters, cut out different sizes of flowers. You can just do 1 of each or up to 2 of each size. Step #3: Once you have your flowers, pinch the corners to achieve the succulent leaf look. I’m sure there are better cookie cutters for this out there, but these are all I had on-hand at the time, which were easy to turn into succulent leaves with just the pinch of a finger. Once you’ve pinched the tips, place the flower molds into mini cupcake tins and let them sit out for a couple of hours uncovered to dry a bit in that shape. Step #4: Take a small ball of fondant and make a few mini leaves for your center. I find it’s easiest to just mold these leaves by hand. I made 3 small leaves to wrap around my ball and then added 4 more leaves, just a little larger around my base to make up the center of the succulent. Once you have your center, you’ll want to just stack your flowers by size. Use a bit of water in between each layer to stick the fondant layers to each other. And now you have yourself some house plant cupcakes! How great would these be for a house warming party!? Brilliant tutorial – so unique! Also wanted to say it’s great to visit a blog that doesn’t take forever to load! These are amazing! They’ve given me some great ideas, a mexican themed party being the first! Thanks for sharing. makes my day hearing that! thanks so much! These are incredible! I love them! Good work on the write-up/how-to. Creative concept and beautiful end product! I’m planning to employ your techniques on a cake for my girlfriend (succulent garden cake!). Had you ever considered using with marzipan instead of fondant? I’m vegetarian so the gelatin in fondant is a turn off. Considering coloring/sculpting it in the same fashion! I don’t have too much experience with marzipan, but modeling chocolate would also do the trick! these are the CUTEST CUPCAKES. fantastic idea, gorgeous photos and great tutorial! thanks for sharing, alana! Whoa, these are totally gorgeous and your pictures are so great. It looks like it took hours to make these and the post..how did you get such pretty, consistent lighting??? just shot them on a table next to my kitchen window in the afternoon, so the lighting wasn’t too harsh. lighting is always tricky though! Love the idea and the post…thanks! Absolutely obsessed! Hope you don’t mind if we share this! not at all! appreciate it! thanks so much! These are great. Thinking Cinco de Mayo party. i have some fun pinata cupcakes too that you can see here: http://alanajonesmann.com/2013/05/diy-pinata-cupcakes/ and if fondant/modeling chocolate isn’t your thing, use airhead candies or laffy taffy for the fringe topping! Wow…what a beautiful job you did! I’m in awe!! Love these! Live in New Mexico the southwest and just loved the creativity of the cupcakes, will try to duplicate them . How did you make the one in the back the conophytum? Looks like the real deal! check out the comments below – included a little instruction for that one! This is absolutely extraordinarily beautiful! Alana, you are a master! I would never be able to eat it though. They are just too gorgeous. Congratulations on something totally unique and super special! This is such a clever idea. Those cupcakes are adorable. those are so flippin adorable! It is a shame you are not in London… I would definitely order some. Fantastic cupcakes! These are so clever! You’ve done such a beautiful job! Thanks for sharing!!! If you’re wondering where all the hits are coming from, your cupcakes were shared on reddit. They look fantastic and I don’t even like cupcakes! Now these look like they are pretty easy to make and look great, I bet they would take great if you made them with devils food cake, it would kind of taste like a s’more, chocolate, graham crackers and the marshmallow fondant. So cute, and they look like so much fun to make. You did GOOOOOOD!!!! I’m wondering on the first one if you could make the core a carved piece of cake or rice crispy treat formed. I don’t really care for fondant, much less that much of it, but not sure if anything else would work as well. Thank you for the ideas; my brain is racing thinking of when I can make some…lol Thank you! rice krispie treat would totally work as well! Seriously Awesome!! These baked in small terra cotta pots would be to die for!! My Mom loved succulents too! @ Allana, such beautiful work!! You did a wonderful job! I want to try them too.Thank you so much for your directions, they are very simple to follow. I hope you will so more of these projects. Again, Thank you, very much! thank YOU for checking them out! really means a lot! What a great way to think out of the box .It is wonderful . I love it!!!! Congrats for your post!! It’s amazing! The cactus I have at home always die, at least I can eat those! Simply amazing. I might have to make my own succulent cupcakes for my birthday. You’re a rock star! Could you do a tutorial on the cute one with the white dots in back? And do you think cake pops or mini cake pops would work as a substitute for the fondant balls? Juste tres beau et presque dommage de les manger! Vous etes une artiste ! Bravo. Omg! This is incredible! The most adorable food I have ever seen! Faux Plants That Will Fool Your Eyes - Faux Sure! My daughter just sent me this link! I belong to a garden club and can not wait until the next meeting to present these to the group. Thank you so much. i have seen many preparation on your web site really-it is one of art for eating people generally present generation youngsters-like your Delicious new choice food . actually i would like see you. wish me luck! I’m going to try to make these for my daughter baby shower. She’s having her party at a succulent garden. If they come out even have as adorable as your I will be thrilled. Wow! what a fantastic idea , I loved it, thanks for your sharing. decorados como cactus¡ también preparo algunos. pero estos me fascinaron!!!!! Ouch, My Tongue! : Realistic Cactus Cupcakes | I always say shopping is cheaper than a psychiatrist. The Cupcakes look really hard at first but with you directions it makes it look so easy!! 8 Adorable Cactus DIYs | Darby Smart Blog! What frosting recipe do you use? Don’t use cream or milk in your frosting and the consistency will be less affected by the temperature. And as long as your room is a moderate temperature, you’ll be fine! I always wondered: are you supposed to eat the fondant/frosting ? It looks beautiful, but most taste very sweet, no ? So adorable! I’m going to try it. My college kids think it would be fun for their Spanish and Latin Club Banquet and want me to try it! I love these! Your leafy plants remind me of Ariocarpus retusus or Euphorbia suzannae. Mother's Day flowers your mum can eat! The Top most AMAZING Cupcake Ideas! ALANAJONESMANN great job.i love and like it.Thank you for sharing great and helpful article.